I found this loverly lady on facehunter. 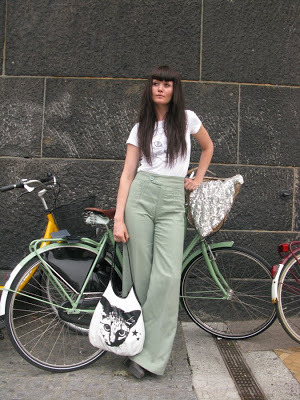 I wish I had those minty green high-waisted jeans and a matching bike. And she has a cat bag. I love cats. I chased one in our garden today. Well..I tried to feed it chicken slices but it was having none of it and hid in some bushes. I felt a bit like a cat during V and my cat ears were worn rather often. Didn’t get many pictures of my though, it was more about the music. Kings of Leon and Muse were so amazing. I’m so happy I finally got to see them. There were however people doing cocaine next to me in the crowd, and one guy was actually sleeping while standing because he was so high. I have never seen people actually do drugs, it was so unreal, like in a bad movie. Hugs not drugs people!